Walt Disney World, December 2005. I did not want to carry a tripod so I found a small statue and carefully braced the camera against it for several time exposures. I believe this was taken at f8, 1/5 second exposure, ISO 100. Camera was a Minolta/Konica D-image Z3 point and shoot. On fireworks photos, it helps to experiment with white balance settings if your camera has them. I think I was using the color balance setting for flourescent lights to make this image. The incandescent light setting also works good. The best technique is to start shooting at the first part of the show and check your results often to get your settings correct. By the time the show's intensity increases toward the end, you will be ready with the proper exposure and shutter speed, plus you will have your aim and timing down better. 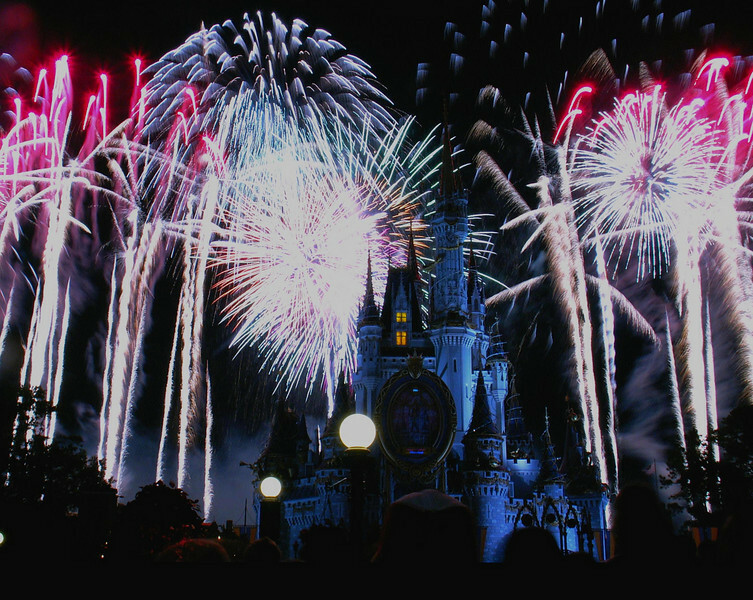 The biggest fireworks usually go off higher in the air than the others, so aim high!